The way we conduct business and treat one another – our Team Members, customers, community members and valued partners – defines what the Giant Eagle culture is all about. We ask ourselves two things each day: Is this the right thing to do? Is this good for our business? By making ethics and integrity priorities at Giant Eagle, we can all be proud of the work we do. There is something special about the retail business, and we love it that way. We feel at home here. Everyone at Giant Eagle has the freedom to share their thoughts about what we could do different, and how we can better serve our customers and our colleagues. In fact, that’s what Our Common Purpose is all about: Together, we improve people’s everyday lives and well-being. VALUE and RESPECT the dignity and well-being of every person. Continually COACH and DEVELOP each other. MOTIVATE each other to ACHIEVE more than we ever thought possible. Giant Eagle began in the hearts and spirits of five men in Pittsburgh more than 85 years ago. They began our business as a small local chain, characterized by innovation and a competitive drive. Under their direction and example, our company helped pioneer the first true supermarkets, customer loyalty cards, in-store child care and one-stop shopping. Today, with hundreds of locations throughout four states, we’re still led by the original families. Together, we delight in meeting our customers and communities at their points of need – whether it’s for their large stock-up trips, mid-week convenience needs or that special ingredient available only through us. Take a look at our history video to see the roots of our passion for innovation and never settling for good enough. Passion. Hard work. Innovative mindset. Competitive spirit. The foundation of today’s Giant Eagle was built upon these qualities. Qualities that made up the character of the men who started it all. In the early 1900s, five determined entrepreneurs (Benjamin Chait, Joseph Porter, Joseph Goldstein, Hyman Moravitz, and Morris Weizenbaum) set out to create meaningful work for themselves and to build a better life for their families and their communities. Four of the men (Chait, Porter, Moravitz, and Weizenbaum) immigrated to Pittsburgh from Eastern Europe. Goldstein was born in Pittsburgh’s Lower Hill district. 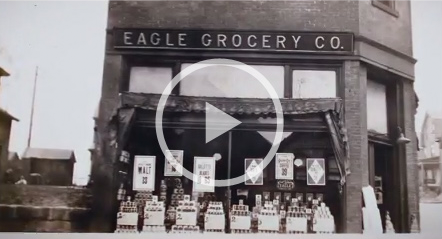 The Goldstein, Porter and Chait families opened a small company and called it Eagle Grocery. Over the years, that company grew steadily to 125 stores. In 1928, the family sold Eagle Grocery to the Kroger Company. As part of their arrangement, the three families agreed to stay out of the grocery business for three years. While Eagle Grocery was busy growing its chain of stores, two other families (Moravitz and Weizenbaum) had also been building their own successful store chain named OK Grocery. In 1931, recognizing the potential for even greater prospects and with a shared commitment to their customers, the five families (Chait, Porter, Goldstein, Moravitz, and Weizenbaum) joined forces and the first Giant Eagle store opened in Pittsburgh in 1936. In local Pittsburgh area neighborhoods throughout the 1930s and 1940s, Giant Eagle’s popularity grew as both Giant Eagle Supermarkets and OK Grocery Food Stores. Being that this growth took place during the challenging times of the Great Depression and World War II, is a testament to the stores’ value and commitment to customer service. As soldiers returned home and America found new prosperity, so did Giant Eagle. The five founders passed along their innovative spirit to the second generation of Giant Eagle leaders who continued their steadfast commitment to entrepreneurism and care for their workers and their communities. These leaders (Irwin Porter, Stanley Moravitz, Norman Weizenbaum, Saul Shapira, and Milton Chait) were responsible for leading Giant Eagle through monumental growth in the late 1950s and 1960s. During his 30+ years as chairman, Chief Executive Officer, and president, David Shapira (a third generation family member) along with Board Members: Gerald E. Chait, Edward Moravitz, Charles Porter, Norman Weizenbaum, Charles C. Cohen, Alan Guttman, and Farrell Rubenstein; positioned Giant Eagle as an industry leader and took the company from a local chain of 50 grocery stores in the early 1970s to an organization with more than 400 locations and $10 billion in revenue. Now, in it’s fourth generation of family leadership, Laura Karet remains committed to serving our four loyal constituents: Our Team Members, Our Customers, Our Communities, and Our Shareholders, focusing on the company’s long-term success and innovative growth. While there has been much growth and change over Giant Eagle’s 82 year history, some things have remained the same. That sense of community and family, our company is still owned by the original five families who remain actively involved today. The Passion, Hard work, Innovative mindset, and Competitive spirit of our five founders is still reflected in our Giant Eagle family, our more than 36,000 dedicated and talented team members who work in our stores, retail support centers, and offices. In recognition of what these founding families have achieved, we should all take pride in the contributions we make daily to continue their inspiring legacy.